I trained for this more than any recent event, mostly because I knew my legs needed to be in shape for the biking and running. The Rose Bowl was perfect for this – mostly flat with some very gentle hills and a 3.15mi loop. I would do several laps for a bike workout or 1-2 laps for a run workout. I also did a couple of practice duathlons – transitioning at the car. So I felt pretty prepared. I packed up all my gear the night before and got up at 5am the morning of to drive to Rancho Seco Park so I would have plenty of time to park, check in, and prepare my transition area. I’d never done something like this before, so I checked out how other ladies were setting their stuff up, putting the bike on the rack by the seat and organizing their various shoes, clothing, and towels (for triathletes) on the ground next to the bike. It was so cool being at an event that was just for female athletes. There were 4 events – Super Sprint Duathlon and Triathlon and Luna Bar Duathlon and Triathlon, so there was an event for everyone, from the not-so-in shape to the serious triathletes. Throughout the day, everyone was really supportive of each other and sports-woman-ship was everywhere. Plus, I didn’t often see this many women in my years at Caltech (only at frisbee tournaments, where the camaraderie is not so good…) Yes, boys, it was nice for all of you to be on the sidelines just cheering us on. Looking at all the ladies setting up in the transition area. My race was a 2 mile run, followed by a 20 mile bike ride and a 4 mile run. These last 2 legs were shared with the triathletes, who started in waves on a .5 mile lake swim. When we started the first run, we all joked that we would rather be jumping in the lake – the run course was in the sun and it was already getting hot. I’d drank about 2 Liters of water since waking up, though, so I think I started out pretty well hydrated. I focused on pacing myself on the first run – I have a tendency to go out WAY too fast and tire myself out early and felt good and relaxed on the first run, doing 8-minute miles, faster than I’d expected. My first transition went well and I felt fast and strong going out on the bike course, even though I was getting passed by triathletes who’d clearly trained more than me (my cycle speed is currently only about 15 mi/hr, whereas I imagine the best athletes were probably around 20mi/hr). I had taken two shot bloks before starting the race and took the remaining 4 shot bloks at intervals throughout the bike ride (it’s way easier to do bloks/gu while cycling than while running) and trying to stay hydrated. The bike ride was an out-and-back course and it seemed there was a little more uphill on the way back, plus a headwind, so I didn’t go quite as fast and my legs started to get tired, but I kept going. I only had one almost-bad incident when some bitchy lady honked at us from behind (I guess she was impatient to pass?) and I jumped, accidentally nudging my front wheel onto the soft shoulder. Miraculously, though, I got back on the road almost immediately and hadn’t been at one of the spots where the pavement dropped off several inches to the shoulder. A passing woman congratulated me for not crashing and flipped off the rude driver for me. The final run was hard for me, not only because it was longer than the first run, but because my legs were really tired and my stomach was feeling really awful, as it often does on races. Normally, 4 miles wouldn’t be too bad of a run for me, but the heat and tiredness made it a big challenge. I focused on my breathing, and on taking advantage of the downhill sections (which not a lot of people seemed to do). 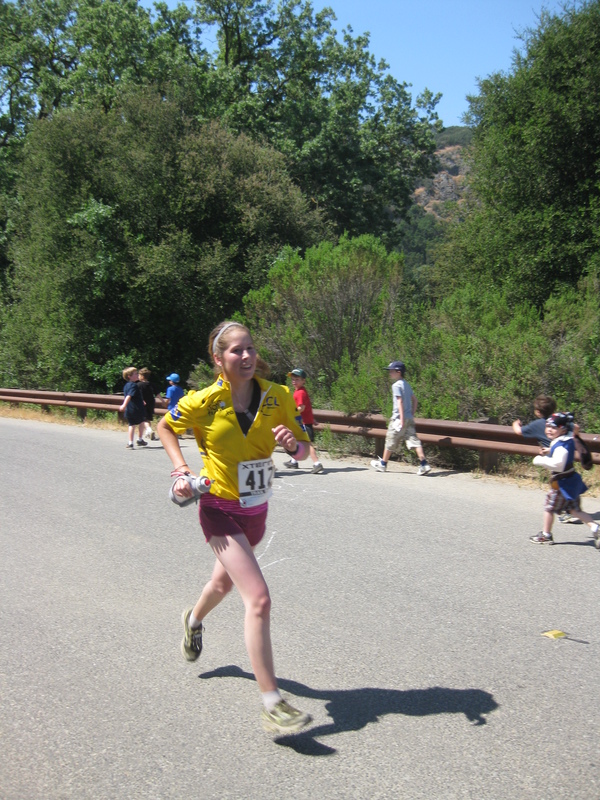 I had a cup of electrolyte and a cup of water at every aid station (every mile, which was great! ), using most of the water to pour on my head to keep cool. I ended up finishing in 2:24:50. I’d not had a good idea of how long this should have taken me, but I expected to take over 2 hours and, based on the return part of the bike course and the second run course, I was pleasantly surprised by this not-too-terribly awful finish time (the winning time was 1:57:00, the last finisher was 2:54:54). I was 8th out of 22 athletes in the Duathlon and 1st (out of one athlete, but hey, I was competing just against myself anyways) in the 20-29 age group. 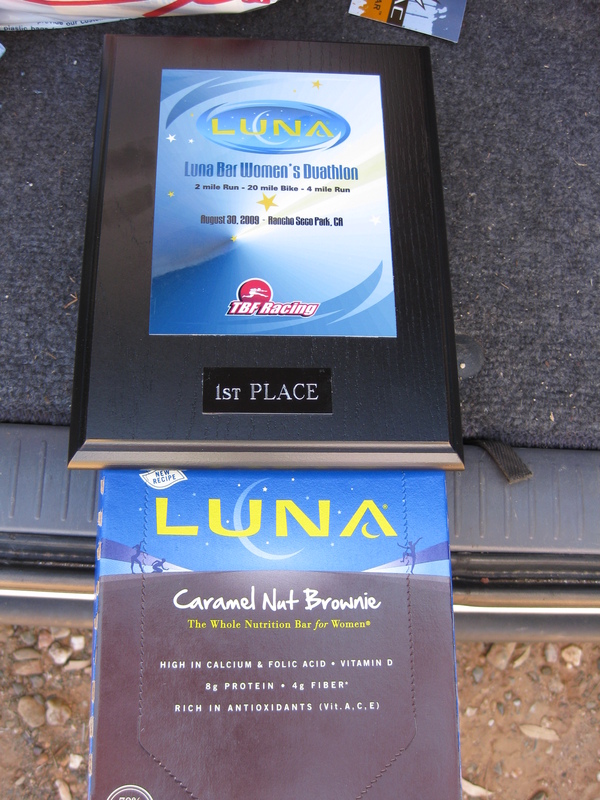 My 1st place plaque and free box of Luna Bars! Overall, this event was a great experience! Everyone was really friendly and supportive. It made me really excited to get into triathlons next season because I still don’t really love running, but I enjoy biking and swimming. This was a lot more fun than the long trail race I did in May, even though I covered more distance, because I got to ride my bike! In the meantime, I’m hoping to get my cycling speed up, get back into swimming, and maybe compete in some shorter trail races (I’ve always been better at running less far…) so I can work on my speed. If I’m not out in the field for this event next year, I definitely want to do it again! Check out this page for info about the race this year. Do any of you blog readers do triathlons? Any training tips? The more climbers I meet, the more I realize that my experience of climbing has been unusual. I feel lucky to have had the experiences I’ve had, because they’ve allowed me to have what not every 21-year-old female climber has – a passion for trad climbing. I love sticking my hands, fingers, and feet into cracks. I love the complexity and freedom of placing my own protection. 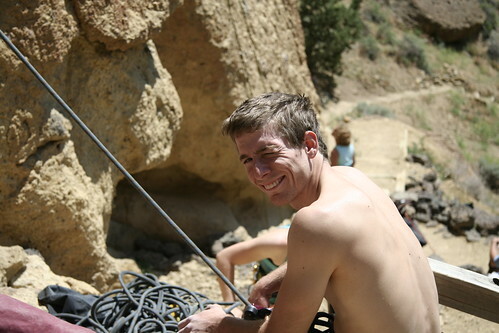 And, of course, I love the incredulous look that boys give me when they see me racking up for a hard trad route. This is the story of the journey that’s got me here. It all started during the summer, 8 years ago. I was 13 and on a summer camp trip – a little bit of outdoor climbing and some river rafting in Washington. We were climbing at Mt. Erie, a scenic beginner crag in Northern Washington, and this was my very first outdoor climbing experience. I was toproping one of the routes (nothing too hard – I doubt we did anything harder than 5.9) that had a crack in the top section with a small chockstone in it. I grabbed the chockstone, making my hand into what was probably something close to a fist jam. I had some tense moments when I thought my hand was stuck, but once I relaxed everything was good. 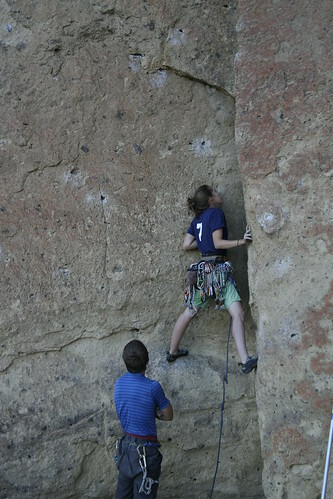 So I guess to a certain extent, crack climbing was intuitive for me from the beginning of my climbing career. Fast forward several months to the next spring. I am 14 and heading to Joshua Tree with other students from my high school for “Project Week” – a week before spring break where students head out to have non-academic adventures – volunteering, art, outdoor adventures, etc. I was totally psyched to be going to such a classic climbing area and, having read about trad climbing in climbing magazines, was hoping to learn to place the widgets and maybe start leading. Although leading was too much to ask for this trip, I did learn how to place nuts and cams, both for leading and building anchors. Even better, I learned a lot more crack technique and loved every bit of it. I learned to hand jam on a vertical, perfect hand crack where there was no chance to cheat by using face holds or laybacking. It was magical, after trying the non-crack climbing options, like double gaston-ing the crack, to slot my hand in, drop my thumb down, and pull on a perfect hand jam. I came back from the trip utterly in love with trad climbing. 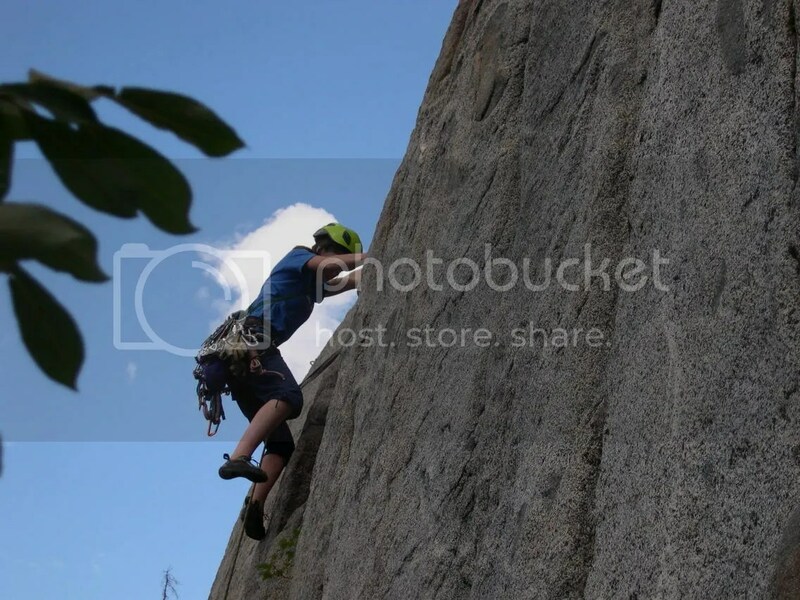 Over the next year, I went on as many climbing trips with my high school’s Outdoor Ed program as I could manage, snagging my first trad leads on the short crags of Leavenworth, WA. I even went on the trips for the middle school students as a “student leader”. My parents would only let me go climbing when guides were around, so I took every opportunity to have them critique my gear placement and tried to absorb every trick for anchor building, multi-pitching, etc. 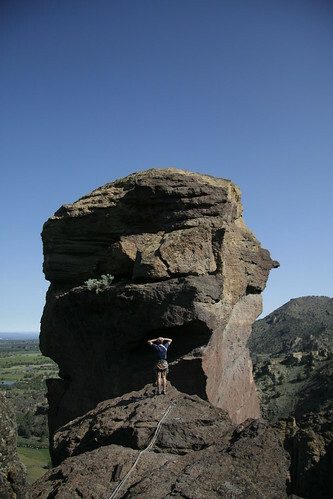 Leading Karate Crack (5.10a) in Summer 2004. The spring of my sophomore year, when I was 15, found me on a climbing Project Week again, this time to iconic Smith Rock in Oregon. Although I didn’t get to lead anything on this trip, I got to toprope plenty of excellent climbs, including the classic Karate Crack, and “mock-lead” some routes to have my gear critiqued more. I was learning the critical balance between moving efficiently and pausing at length to place perfect pieces. Learning about rope management in the North Cascades. The next few years saw me grow even more involved in participating in and leading Outdoor Ed trips, taking every opportunity to lead trad routes that I could get. 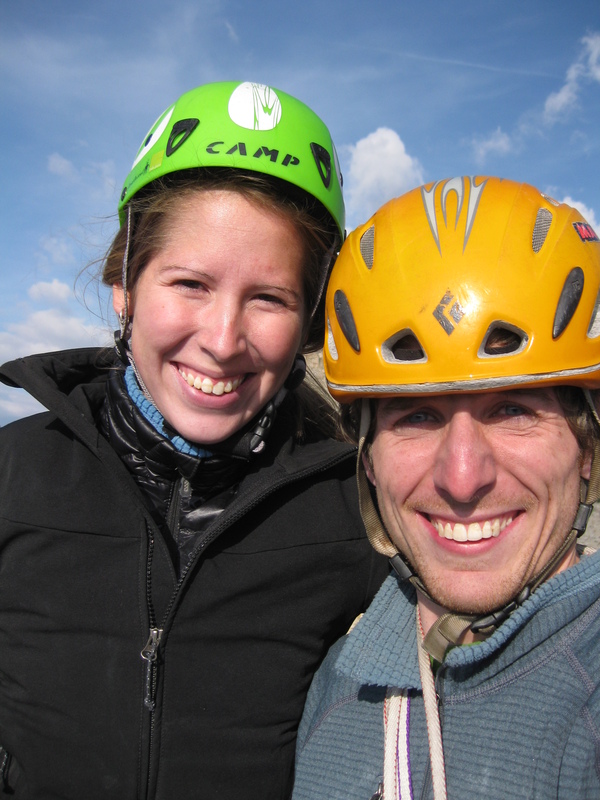 I also had the amazing opportunity to go on climbing trips organized by the Northwest Mountain School, a small guiding company owned by my good friends John and Olivia. 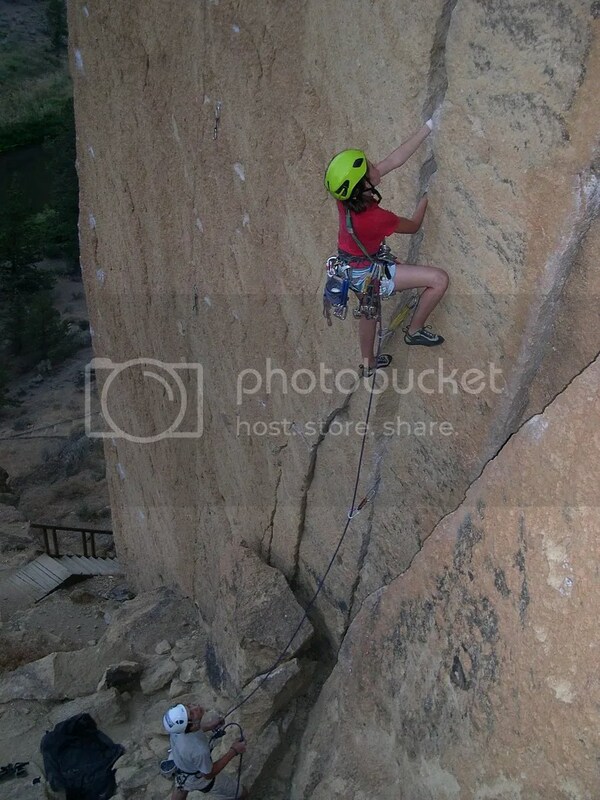 On these trips, I had the opportunity to climb at Smith Rock (both summers) and in the North Cascades (2nd summer). John and Olivia and the rest of their guides were very encouraging and gave me tons of opportunity to lead. 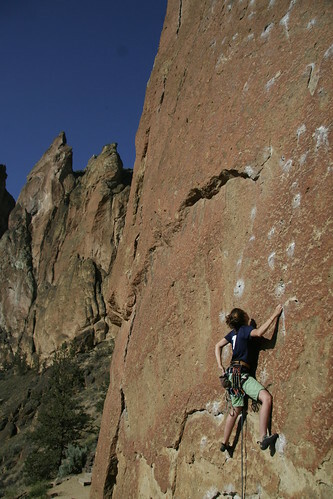 On our 2nd Smith Rock trip, I onsighted Moonshine Dihedral (5.9), my first onsight of the grade, and redpointed Karate Crack (5.10a), my first 5.10 lead and a route I’d been in love with since I first toproped it. 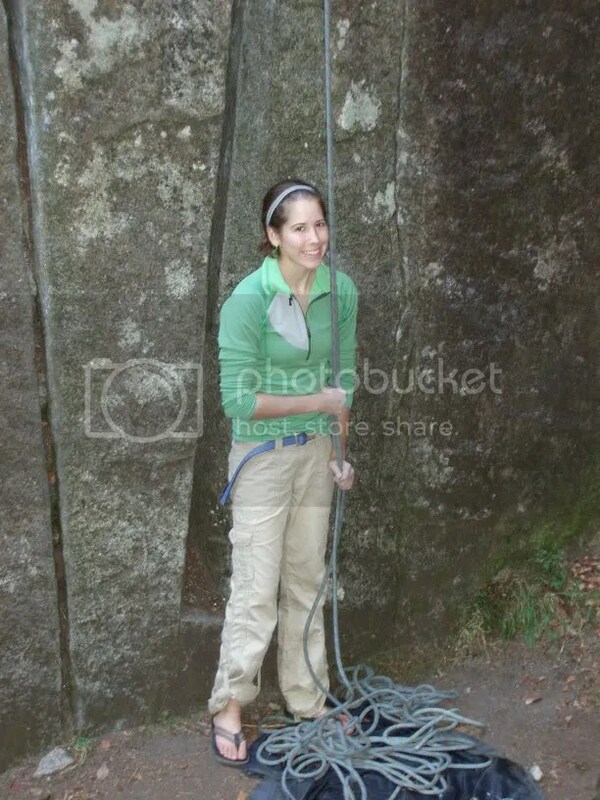 Climbing in the North Cascades taught me a ton of important skills for rope management, anchor building, etc. for multipitch trad climbing and I continued to refine my crack technique on gorgeous granite cracks. Leading at Pearly Gates in Summer 2004. During my senior year in high school, I organized and helped lead my final Project Week trip, this time back to Joshua Tree. I lead my first J-Tree 5.9s, a big step for me since the grades there tend to be a little stiff. 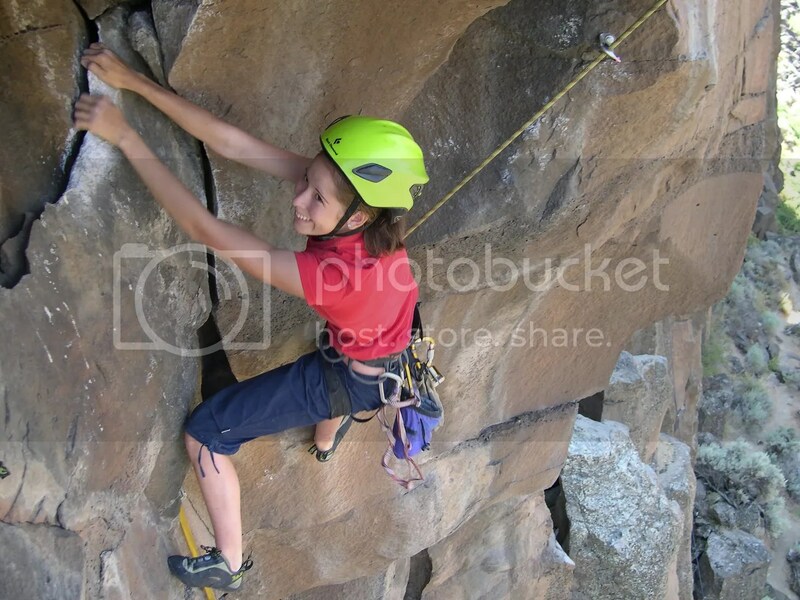 I spent the summer afterward teaching climbing camps for kids (I got the 4-10 year old crowd, quite a challenge) and dreaming of all the climbing I would do in college in California. I lead Index 5.9s (another step up from Joshua Tree 5.9s) including Godzilla, Princely Ambitions, and Roger’s Corner, taking advantage of the freedom my parents had finally given me (at 17 years old) to go climbing without being accompanied by guides. I dreamed of long granite trad routes, perfect sandstone splitters, lovely basalt columns – I knew college was the time when many climbers really got serious. 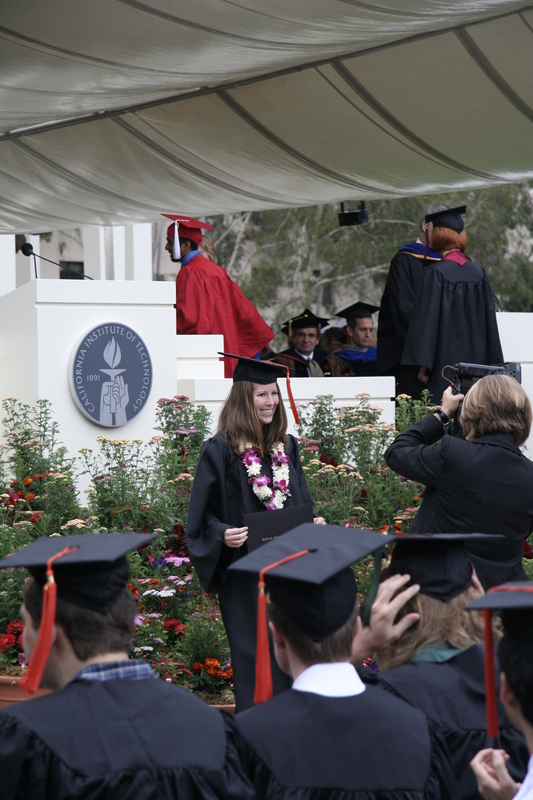 But I had chosen to go to the California Institute of Technology, which is not exactly a “normal” college. Over the past 4 years, my schoolwork was intense and time-consuming, taking up much of the time and energy I’d hoped to devote to climbing. Nevertheless, the myriad of climbing areas within semi-reasonable driving distance of Los Angeles and the boundless enthusiasm of Luke have helped me bring my trad climbing to a whole other level, even though my progress has seemed frustratingly slow at times. 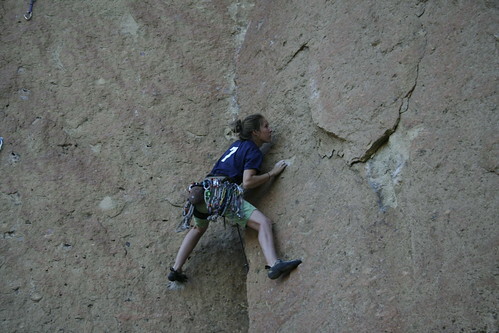 Psyched and tired after sending Even Stevens (5.11b) in August 2006. 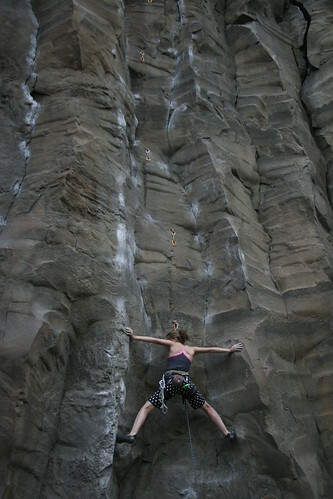 Redpointing the classic Scarface (5.11-) in March 2008. The next year, Luke and I managed to travel across the country many times to see each other and climb together, although it was not a particularly great year for my progress. I got overwhelmed with school and Ultimate Frisbee. However, in the Spring of 2005, Luke graduated from college and moved out to California. My school and climbing schedule changed entirely. 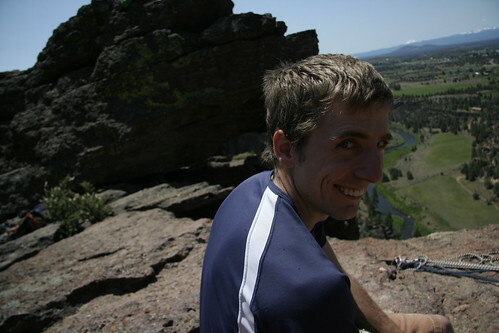 I began working pretty much every waking hour during the week so I’d have my weekends free to climb with Luke. And I did this for my junior and senior years of college. 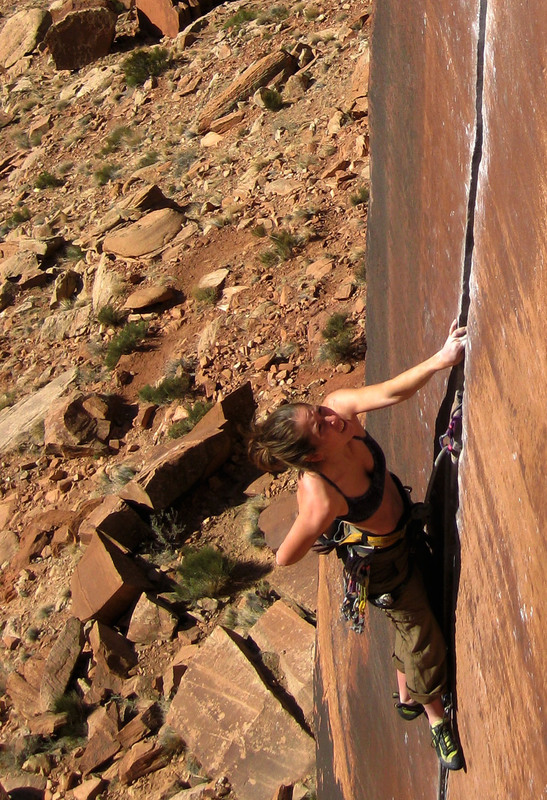 So psyched after onsighting the excellent Rump Roast II (5.11) in March 2009. Although my fitness has been far from consistent during that time, I have definitely made some major improvements. I took time off trad to go bouldering and sport climbing with Luke and I’m sure the skills I’ve gained from these have really helped me a lot. In fact, I pushed my sport climbing to harder grades than my trad climbs (just barely, 11c vs. 11b) for the first time in my career and learned how much benefit I can gain from general fitness and endurance. 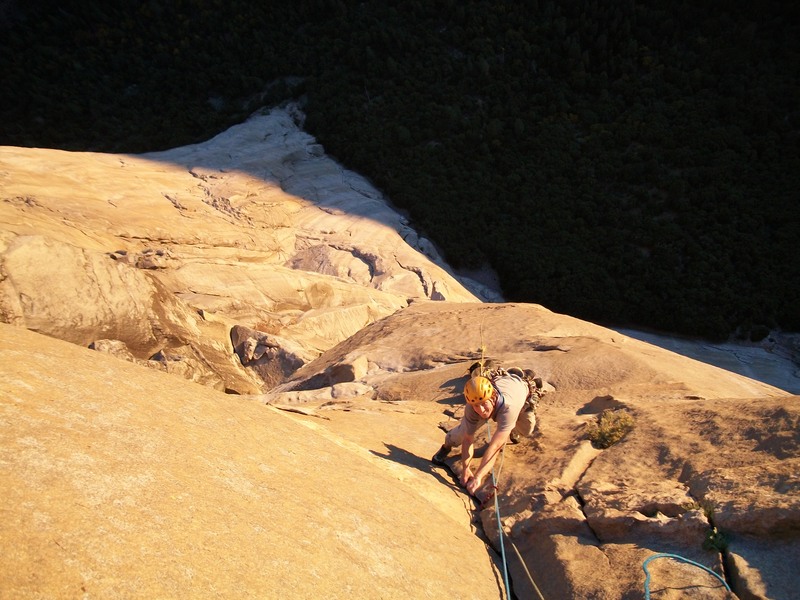 Setting out on my onsight of Sunshine Dihedral (5.11d) in June 2009. I guess I’ve just started to really notice the payoff recently, since this summer has been going really well for me, in terms of sending. 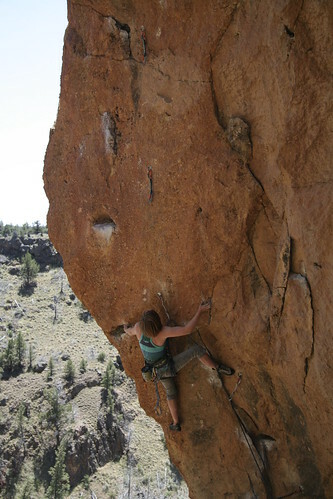 In Smith Rock, I floated On the Road (5.11a) on my first try. I had remembered this climb being tricky, but I hardly noticed pulling the “crux”. Then I did my hardest send to date, Sunshine Dihedral (5.11d), which was a huge accomplishment for me. 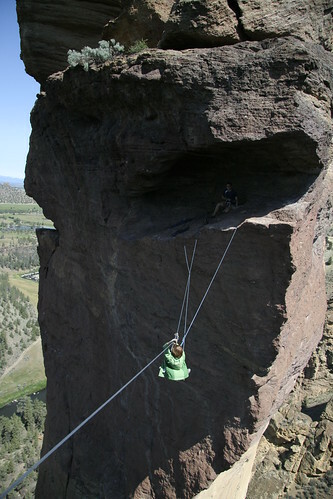 I’ve been dreaming about this route since my first trip to Smith Rock and to have come to a place where I was capable of onsighting it felt awesome. Despite the fact that my sister and I were a little less motivated to send hard in Squamish the following week, it felt good to walk up to the crag, rack up, and climb 5.10s – relaxing even! Sending Crime of the Century (5.11c) and onsighting Yorkshire Gripper (5.11b) on the last day, I was feeling strong, loving the widgets. Looking back, I feel lucky to have had such great opportunities to be mentored. I think trad climbing is probably the one discipline of rock climbing where one can gain huge benefits from learning the ropes from an experienced “mentor”. 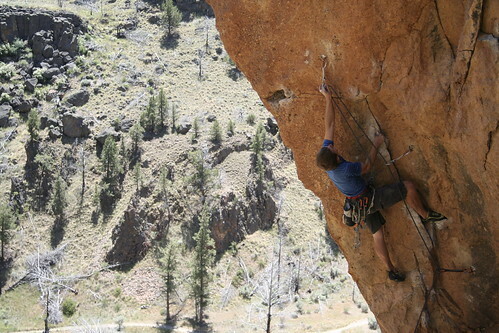 I guess there may also be a certain element to trad climbing that is intuitive – jamming has always felt resonably natural to me, as has climbing between stances. Progression has been understanding that a “stance” doesn’t have to be two huge footholds – it can be a solid finger- or hand-jam, a stem, even a solid foot-jam. Furthermore, the mental space for trad leading – thinking not only about moves and rests, but also about gear placement – is not something that you would easily develop when you start climbing in a gym (which I did not). But at the same time, I really believe most of this can be picked up if you invest enough time. Sure, trad climbing isn’t for everyone. But for me, it is the most exciting, motivating, challenging form of climbing. I’m not sure I will ever be as psyched for anything else (as you may tell from the fact that the routes on my tick list are all trad routes). Last year we went to Indian Creek with a plan and a Tick list. We had looked online and at the 1st edition of the Bloom guide and came up with 27 classics at 11 different crags. These climbs were our main objective and we were not “interested” in doing much else. We managed to get on more than half of these selected classics and at least 13 were either sent on lead or top rope by one of us. This was an interesting approach but added unneeded pressure and while limiting our exploration to the creek. 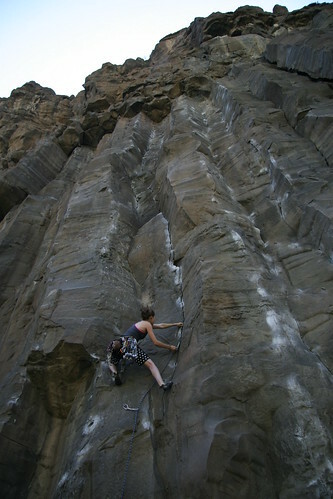 In 2009 Lizzy and I decided to eschew the ticklist and try to climb as many routes as possible at crags we had never been to hopefully finding some of IC’s hidden gems. Enjoying the Utah scenery and the 75 MPH speed limits! This year we also decided to come two weeks earlier which meant colder weather, forcing us to to chase the sun. The weather was not a big concern since the previous March we had to leave the Cat wall since it was too hot. The drive to Moab took about 12 hours from San Diego with plenty of gas stops and the mandatory visit to The Orange Peel in Saint George for bubble tea. We rolled through the creek just after dark and headed for the Creek Pasture campground at the far end of the 211 past the Super Bowl (which is often quite dusty). We saw only one other group and happily snagged a “site” with a picnic table. Having a normal table was a big improvement from the make shift knee height table we used in 2008. Being able to cook standing up and keep the stoves and food out of the sand is a really nice creature comfort. Getting ready to lead the first route of our 2009 IC trip! Our first day we wanted to keep things easy so we headed to the Original Meet wall for a hearty helping of 5.10. By starting on easy climbs we could get some fitness and have both Lizzy and I lead the routes. I started on Ladies First, seen above, did Wee Doggie which was super fun and then hit Tofu before lunch. These three routes were all 5.10- but definitely varied in difficulty. I had an eye opening moment on Tofu, which was described as off-fingers, when I was run out above my tipped out .75 wondering if it would be safer to keep going at least another 8 feet to where the crack thinned down or if i should jump… I kept it together and laybacked to safety and learned that I should be more careful with my gear selection. At times the guidebook suggests and incomplete rack and it can be safer to bring a few extra cams. The climbing was pretty spread out at the Original Meat wall but the one advantage is the potential for First Ascents! On our way to the far right side of the cliff to do Wee Doggie I stumbled across the gem pictured above. The line is obvious but very thin and I am sure that it should be at least 5.12. There was no chalk, no anchor and the first foot hold was a piece of loose rock that could easily be removed. If I had my drill and some bolts I would have aided it and sunk in an anchor that day. For better or worse I am going to have to wait until at least Thanksgiving before going back and trying it. I don’t know why it hasn’t been climbed other than that it may be a bit slabby for some people’s preference. As well it is thin but with all the pods in the middle it seems doable. A very excited Luke at the thought of doing the First Ascent! After climbing a fun unnamed corner that, unknown to us at the time, was on our 2008 ticklist we made the long walk to the Sacred Cow wall. From the book it seemed that it would not be to far but it took us at least 15 to 25 mins to reach Fatted Calf. This climb was supposed to be the Scarface of the Sacred Cow wall and since I enjoy thin hands I wanted to gave it a burn. It was my hardest climb of the day at 11- and I struggled at the start but managed to hang on as the crack widened to #2 camalots. Unlike Scarface the crack thinned back down to #1’s at the top and made me fight for my onsight. There was small horizontal at the anchor that allowed me to tap some of my unused crimping strength to clip the anchor. A gem of a climb for sure and my first 5.11 onsight of the trip!! Hanging out in the sun at the Origonal Meat Wall ! We spent the morning of day two at the Optimator. We warmed up on Lady Pillar which was fun and simple and then did a tricky unnamed twin crack before I went on to lead Hayduke Lives. Hayduke was very fun and involved a karate kick move to get established in a wide hands crack. I channeled Didier a la From Switzerland with Love made the move and onsighted the route. Lizzy was up next and got very close to an onsight of Soul Fire falling just short of the anchors. I managed to pull of a flash but was pretty pumped by the end. This route was hands to tight hands with a bit of stemming in the middle. It was pretty splitter and Lizzy and I both placed seven!! red camalots. Lizzy before her attempt at Soul Fire 11-. In the afternoon we stopped by Donnelly canyon to do the classic Generic Crack. True to it’s popular nature there were people on the route and funny to see other parties after our quiet morning. We did Binou’s Crack to wait for the other party to finish and then I onsighted the classy 120′ hand crack. It was super fun and amazingly consistent in size with some tricky sections through some larger pods. After Lizzy top roped Generic I gave it another burn to use up all my energy before our rest day. Monday night would be our first night in the luxurious yurt and the timing was perfect. A storm rolled thorough Utah and deposited 8 inches of snow outside our door step and 4 inches in Indian Creek. Tuesday was our rest day so the timing of the snow was not too bad. After a long night of feeding the wood stove to stay warm it was nice to sleep in before going to Moab. Luke tends the stove to stay warm in the snow storm! Luke gets ready to drive to Moab. After shoveling a bit of snow we got the rav out on the un-tracked road and started our snowy drive to Moab. I had heard good things about mountain biking in Moab so I was excited to take a rest day and rent some bikes. Lizzy and I had a bunch of fun riding around despite pretty chilly weather and were happy to let our skin recover from all the jamming. Our second night in the yurt was not as windy and it was super easy to cook and clean with a large propane stove and a water jug fed sink. Best of all the huge bed allowed us to fully recover from our long days of climbing. I surely slept well and enjoyed having a bit of comfort. The Yurt has a solar panel allowing us to turn on lights at night and there is a detached bathroom. Lizzy looks happy to be staying in a bed at the Yurt. Our first day back after resting we went to the Cat Wall. We had previously visited the far right side of the wall but hadn’t gotten past Johnny Cat. This time we approached via the left trail and worked our way right. We had a chilly morning but things warmed up fast when the sun hit the wall. After a ok unnamed 5.10 warmup I hopped on Deseret Moon. I wasn’t ready for the 11+ start and skirted around the crux on sketchy loose blocks. It took me a bunch of time to figure out the best way to go up and I had Lizzy pass me a 3.5 camalot to protect the wide moves on this alternate start. I was trying not to place gear to avoid rope drag and spent way too much time getting freaked out. 8 inches of fluffy snow outside the yurt. The upper part of Deseret Moon was amazing and one of the more memorable climbs of the trip. It started off with off fingers to thin hand lay backing with some tricky foot work on a twin crack to the right. The difficulty eased once I could get thin hand jams and the crack widened to #2’s forever. Confident with my hand crack skills from doing Generic Crack I ran it out savoring the wavy wall and the perfect size. I managed the onsight but will need to go back for a proper send via the direct start. 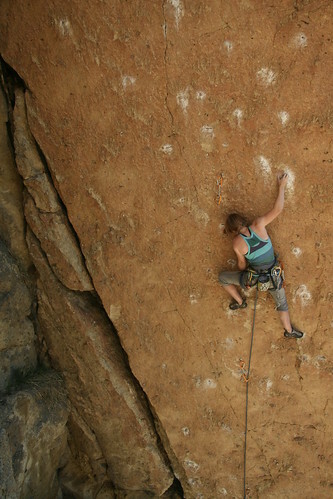 The Cat wall is home to so many hard climbs and Lizzy was psyched to try the thin Puma. It was rated 11+ in our book but the 12- plaque gave Lizzy a few butterflies. She had a great lead falling a few times at the crux before making it to the top. I was even more impressed by her performance when I struggled with the start that was off-fingers for ME. I hung twice at the crux and then finished the climb. We moved on to Kool Cat which and struggled since I was trying to jam the off fingers crack straight in. Lizzy showed me the beta when she one falled the crack on top rope, easily laybacking between the good stances. I know that next trip should yield a redpoint for both of us. On Thursday we were expecting rain and decided at the last minute to go to the creek instead of climbing in Moab. This worked out amazingly well and we had our best day yet at Pistol Whipped. I got a bit confused with the directions and the first few routes we did were chilly in the morning shade. Lizzy and both lead Short and Stupid 5.8+ and then I did Skid Marks 5.10 which she followed. I decided to get my layback on and climbed Revenge of the Rock Gods 5.10+ which was super fun and forced me to place gear while laybacking. It looked like the storm was coming so I made Lizzy wait to each lunch while I tried Spaghetti Western. I had read on Mountain Project that this was an amazing steep hand crack and I was hoping for an onsight. Luckily it was a bit thinner than Think Pink and I made good progress through the initial steep bulge, smartly placing gear at my waist instead above my head. The top was still tricky and I wished I had a bit more gear as I slowly funked my way to the top. The weather cleared up and after lunch Lizzy onsighted Coyne Crack simulator 11- and I barely eked out a flash. Next I did Wounded Knee 10+ which was fun but I would suggest having a #4 or 4.5 to protect the cruxy offwidth move. There was still plenty of daylight so we did a bit walking around and stumbled on the climb in the photo below. Lizzy below Rump Roast II 5.11 after her onsight! Lizzy got super excited by the description of thin hand and (5) 1.5 which are tight thin hands for Lizzy. She pre-visualized the sections and thought the climb would be doable. It looked hard to me and was excited to have Lizzy ropegun the pitch. The start was a bit harder than it looked but in no time she was at a good rest below the final crack. She slotted some gear, worked through the jams and clipped the anchors!!! Rump Roast II was her first 5.11 onsight of the trip and one of her hardest sends to date. I top roped the climb, happy not to be worrying about placing gear in the .75 sized camalot crack and then cooled down with one more hand crack. The yurt was complete with a stove, sink and couch! Thursday night was our last night in the yurt and the next morning we packed up camp and headed into Moab for our final rest day. After all our shopping and some fun bouldering at Big Bend we headed back to the creek to grab a campsite for our final nights. The creek pasture was a bit more crowded but we still managed to find a site with a shaky table and passed out after our long day. Saturday was initially going to be Lizzy’s Birthday Challenge but we decided to keep things mellow and take the chance to work on Swedin-Ringle. We knew Battle of the Bulge would be crowded so we got up early and started on the far left side of the wall. This was a bit of a mistake as we froze on our warm up, Pigs in Space 10+, since it was in the shade. A plus was that we were able to rap down and set up a top rope on Cold Corner 5.11+. This climb, which started directly to the right of pigs in space, had two bolts protecting some tricky laybacking to some hard moves in to a flare. I was able to flash it on TR and would like to come back and lead it. The moves after the 2nd bolt were quite desperate and my cold fingers didn’t make things easier. Looking out from the Cat Wall. 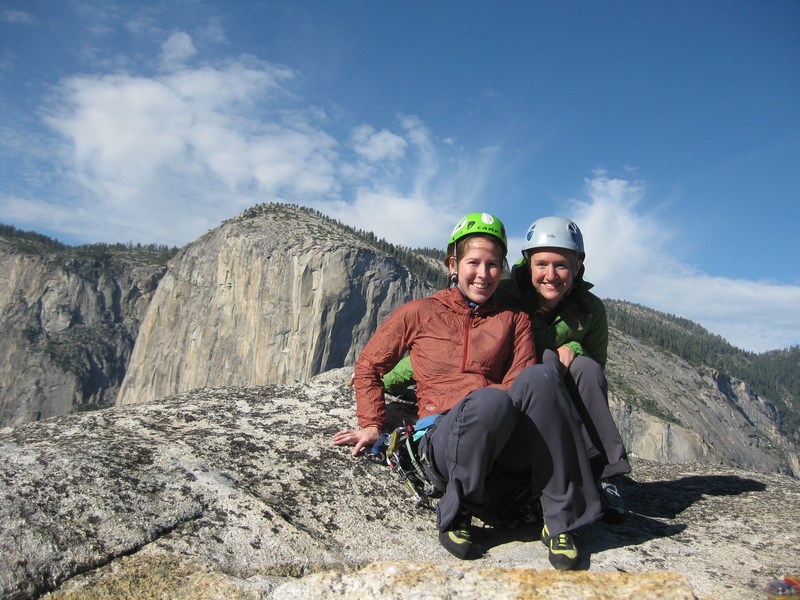 We both rested and warmed up in the sun on a large rock before getting on Crack Attack 11-. Our timing was perfect since I was just ready to climb as anther party came over to try the route. A year before we had tried to climb Crack Attack and it had been occupied. While the business was the pumpy thin hands crack at the end I struggled the most on the the start since the gear was less than ideal ( I was missing a #4.5 and a second #3 camalot). We moved back to the main part of the crag and were instantly HOT. Everything around the corner to the left of Disco Machine Gun was super cold but around the Big Baby and Our Piece of the Real estate we had T-Shirt weather. I was resting up and getting psyched for my main goal of the day, an onsight of Ruins crack. This changing corners finger crack looked super fun and had been too intimidating for me to lead the year before. The start was hard and after a nice rest the business began with some more laybacking until the crack thinned down to green aliens and then pinched out. After making the “crux” switch the the right crack and moving up a bit higher I was greeted with a nice rest and could see the crack widen to hands. After my brief recovery I cruised the sandy tight hand crack to the top and happily clipped the chains! Lizzy’s main goal was to give Swedin-Ringle a good redpoint burn. She had gotten close falling 8 feet from the anchors on two different attempts the previous trip and had saved up enough skin for one effort this year. We figure out gear beta and Lizzy set off easily climbing the start and getting in to the meat of the crack. She got higher and higher and I could tell she was closing in on her bad size. After the last .75, a purple .5 Camalot when in and I knew Lizzy must be struggling. .5’s meant fingerstacks for Lizzy’s small fingers and she had another couple feet before the crack thinned down. Another few moves and she was off. Another effort from her high point allowed her to slide her cam higher and get in a grey alien. Still a few feet shy of the anchors she was beat and after a few tries lowered off, cleaning one of her cams. I wanted to take the easy way out and got ready to lead the route with all of Lizzy’s gear preplaced. I adjusted a few cams and really struggled at the top. As I worked my fingers into the thin locks next to the chains my left foot was shaking in the thin crack. I reached blindly and grabbed a quickdraw from my harness and clipped it to the chains. But when I looked it was a cam, not a draw that was hanging from the anchors. I was being punished for my poor style I thought as I switched my jams and tried to shake out. I grabbed again and this time got a draw and got it onto the chains, instantly having to switch to a lower lock to shake out yet again. I worked my fingers back into the high left jam and grabbed the rope and brought it to the quickdraw just barely getting it into the gate before being overwhelmed by pump. I slumped on the rope happy for the send yet frustrated by the desperate finale. With this final climb Lizzy and I were both tired and ready to go home. We still had plenty of sun but thought it would be better to get back to California. We packed up the tent and bee lined for Saint George. After a nice night in a motel we saw the VRG up close and then made it back San Diego ready to give our skin some rest. This year we took it easy and didn’t put ourselves under as much pressure yet overall we both climbed more routes and onsighted at or near our limits. We are already thinking of going back and hope to make time in November to return with friends and do Turkey Day at the creek. I will be writing another gear beta post on the creek as well as some information about what to do on rest days. This year I had a bunch of fun being in Moab on our rest days and I want to share that great experience. I am sure that Lizzy will also have some thoughts about the climbing as well as some more thoughts about trying hard routes.